Two miles north of downtown Seattle and the Washington State Trade and Convention Center is the University District of Seattle. 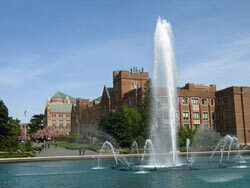 The University area is home to the University of Washington campus, the University of Washington Medical Center, SAFECO Insurance Corporate Headquarters, Seattle Pacific University, and Adobe Software in nearby Freemont among others. You will find specialty shops galleries and museums, movie theaters and restaurants that incorporate the multi-faceted culture and diversity of an education district. The area is minutes from Seattle’s favorite attractions–including Pike Place Market, Woodland Park Zoo and the famous Space Needle.